Amazon has been steadily changing the way the world shops since its inception 25 years ago. And a recent patent application from the e-commerce giant filed at the Intellectual Property Office (UKIPO) suggests that its innovative ideas haven’t slowed down. The patent suggests that Amazon is developing an app aimed at revolutionising the way people shop for clothes. The app will allow users to try on clothes using a virtual mannequin created from data extracted from their social media apps. Does Amazon’s patent application threaten the High Street? In a move that some worry will adversely affect the UK’s High Streets, Amazon’s app could feasibly revolutionise the way consumers buy their clothes. 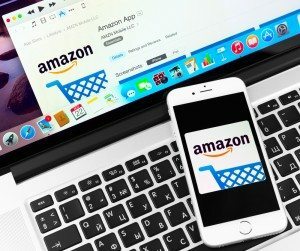 Clothes shopping has long been a mainstay of online shopping, but Amazon’s potential app will take it one step further. The app is designed to scour selfies, online calendars, apps, video and other data from the user’s smartphone, and use this to create an avatar. It would predict the types of clothing that the user might want. By using the user’s pictures from their computer or smartphone, the app would come up with an Augmented Reality (AR) version of the person wearing the clothes they’re considering buying. This could, in theory, eliminate the need for the buyer to visit a changing room. As well as suggesting items of clothing based on the user’s likes and photographs, the app would analyse appointments and any other information. This would allow the app to build up a profile of the user, including where they work, where they live and its usual climate, how they spend their downtime and what they like to do. Using this information, the app would find outfits for upcoming events, or suggest accessories for things the user already owns. It also describes how users will be able to randomise outfits, search their own personalised look and discover alternatives. Customers would need to allow the app to access their personal data, which would then allow it to act as a virtual personal shopper. The algorithm used in the app uses personal information that is “sensed or otherwise provided by the access device to determine the temperature or season in photos to predict what the user might want at any given moment. For example, if the device determines that it’s hot outside, it will show the user clothes suited to that climate. If the user has an event in their calendar showing some kind of business meeting, the app would direct them towards professional corporate outfits. The same would go for all kinds of activities, such as dancing, eating out and hanging out. Could the app change the way we shop? As well as the sheer amount of data Amazon would be able to access, this app could reduce the amount of clothes that are returned to the retailer. Currently, many consumers order numerous sizes and styles with the intention of sending most of it back and retaining just one outfit. For this reason, it’s likely to be popular with consumers, regardless of its potential threat towards some High Street retailers. However, as is the case with all patent applications, there’s no definite indication yet that this app is being created by Amazon. This in an early stage and Amazon itself has refused to comment further. This game-changing app may not see the light of day, but it’s an interesting development by a consistently innovative and disruptive business.